Decrease spending on Defense and Corporate Welfare and Increase Spending on Job Creation and the Safety Net. Increase revenues from Corporations and the Wealthy. Everyone is concerned about creating a 2012 budget that will get the US annual deficit and finally the national debt under control. Republican Paul Ryan has proposed one that would balance the budget on the backs of the poor and middle class while voucherizing Medicare and giving tax breaks to the wealthy. President Obama has proposed one that would keep Medicare the way it is and raise taxes slightly on millionaires and billionaires. Then the progressive Democratic caucus has proposed the “People’s Budget,” which is the virtual opposite of the Paul Ryan budget. All these plans would decrease the deficit over a period of time. First, a little background on how we got into this mess. Number one: a bloated Defense Department whose budget has doubled in size since 2001 . Second, Bush tax cuts for the rich. Bush dropped the top rate from 39.6% to 35%. To be fair Bush also dropped the lowest tax rate from 15% to 10%. So the Bush tax cuts were across the board, but the rich profited most from the cuts. Bush also finagled the income ranges to which the rates applied. For instance, the Clinton 15% rate applied to incomes up to $43,050. The Bush 10% rate applied to incomes only up to $12,000. Then the 15% rate kicked in for incomes up to $46,700. So the Bush rates did nothing for the middle class; they were essentially the same as the Clinton rates. Bush also lowered taxes on capital gains. Clinton kept the top capital gains tax rate at 28% until 1997, when he agreed to lower it to 20%. President Bush lowered it to 15% in 2003. Capital gains revenues increased by 0.7% of GDP from 1994 through 2000 under President Clinton, and they fell to 0.6% of GDP from 2000 to 2004 under President Bush. Under Bush the estate tax was reduced from 55% to 35% and the exclusionary amount was increased from $675,000 to $5 million. Third, tax revenues from corporations went from 30 percent in the mid-1950s to 6.6 percent today thanks to loopholes drilled into the tax code by lobbyists. So corporations are not paying their fair share by historical standards. 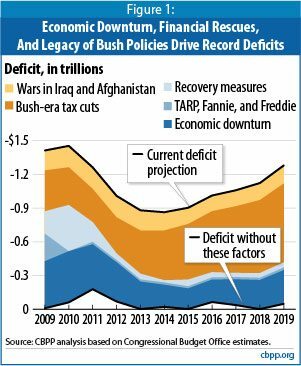 Fourth, the wars in Iraq and Afghanistan started by Bush were unfunded which means they were just added to the deficit. These represent a structural built-in ongoing deficit. Fifth, Bush’s Part D drug plan for Medicare recipients was just added to the deficit. Cheney, notably said, “Reagan proved deficits don’t matter.” Ha. Sixth, Bush signed into law the TARP (Troubled Asset Relief Plan) which was a $700 billion bank bailout although most of this is expected to be paid back. Seventh, in order to prevent a world wide economic meltdown, Obama enacted the American Recovery and Reinvestment ACT (ARRA). However, there are no long term effects of this on the deficit after 2011. It is interesting that the projections of the wars in Iraq and Afghanistan run through 2019. Is this acceptable to anyone? Could we elect anybody who would end these irrational, wasteful actions before 2019? War is not OK, just because Obama replaced Bush. It’s what I’ve been saying all along, but the Tea Baggers would just rather bury their heads in the sand. Maybe if we keep saying it enough, it will actually start to ring true? Hell, it’s worked for the Republicans……..
That approach,saying it until they believe it, should work even better with the truth. Sure W is a Wall Street tool – & for his own – the “top” 1%ers. But W actually inherited the core problem – Republican sponsered (Wall Street Bankster) legislation promoted by Slick Willie Clinton during his undermining of the core of our economy (good paying middle-class jobs), who used a lawerly SELL OUT of the American people to amass his own fortune. 1) Gramm/ Leach/ Bliley Act – removed Depression era protections against Wall Street Bankster greed. 2) NAFTA – wholesale export of USA jobs to Mexico. 3) PNTR – wholesale export of USA jobs to opressors & human rights violaters, Communist China. Sure W was/ is a tool – but “credit where credit is due” – Clinton planted the device & lit the unstoppable fuse.